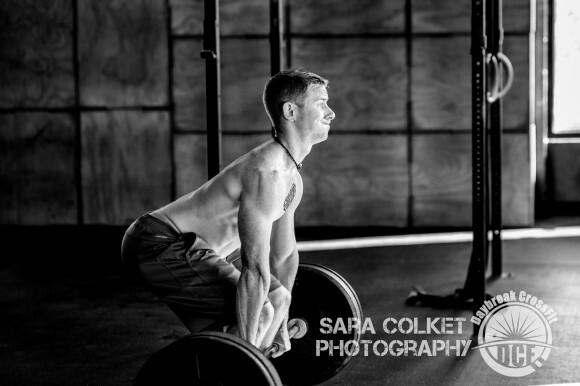 Read about WHY CROSSFIT WORKS. Watch this short VIDEO about what CrossFit means to people just like you. Learn about our COACHES and their unmatched credentials which ensure your safety and results are priority one. Check out our REVIEWS & TESTIMONIALS. Google us. Google others. Better yet, read our highly-acclaimed CHOOSING A CROSSFIT GYM article for an easy-to-use guide for evaluating any and all CrossFits. And see HOW WE COMPARE to other functional fitness options. We’ll train you via highly-varied, functional and safe “real life” movements. No fancy exercise machines here… just good attitudes, 100% effort & sweat. Eat whole foods based on lean meats, veggies, nuts and seeds… some fruit, little starch and no sugar. 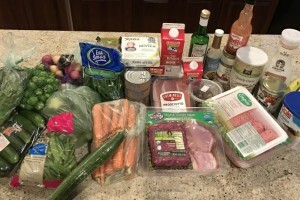 We help you make sense of Zone, Paleo and others. Experience what motivates us, holds us accountable and provides a support system inside and outside the box. You have to experience it to believe it. 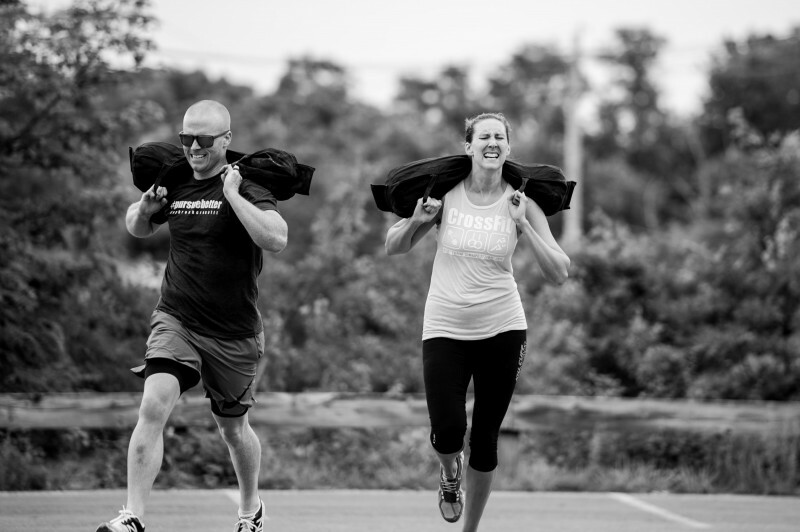 We are home to the area’s most experienced coaches, who will help you reach your fitness goals through the union of CrossFit, nutrition and community. Look, you’re not alone. Each and every one of our members at some point looked at this web page and thought, “Am I Ready?” or “It’s too intense.” or “I need to workout before I go.” Well, just know by the fact you’re reading this that you ARE ready. We manage weights and intensity relative to you, your goals and your abilities. Trust us, you won’t be thrown into the deep end and we will take the time to teach you technique, consistency and then (and only then) intensity. And you DO NOT need to workout before you come see us… kind of defeats the purpose don’t you think?!? 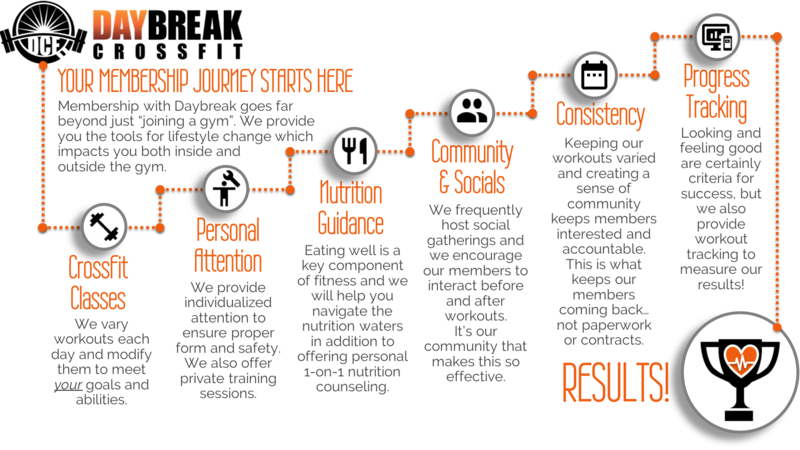 The whole reason why we are in this game is to get you ready… to get you fit… to change your perception of fitness, nutrition and overall well being. To introduce you to a sustainable healthy lifestyle that benefits you inside the gym and out. So what are you waiting for? 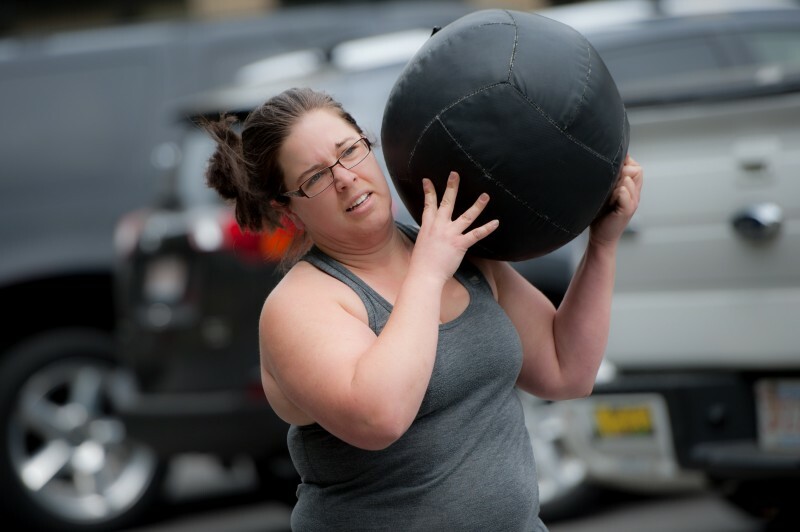 I’M A NEWBIE: If you’re new to CrossFit, we have found that it takes a few classes for new members to “get” CrossFit, or better yet, “get” how Daybreak does CrossFit. By experiencing more coaches, meeting more members and by trying more workouts, you’ll have a much better sense of whether CrossFit is right for you. And don’t fret! Our coaches will be there right beside you from Day 1 to guide you, teach you, and keep you safe. I’M A CROSSFITER: If you’re an experienced CrossFitter looking for a new place to call home, we want you to see all that we have to offer. Our coaches are some of the most experienced in the area. 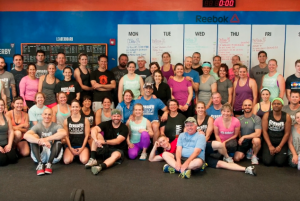 Our community is welcoming and inclusive: all members, coaches (and owners) workout together. Our facility is state-of-the-art and our equipment is clean, functional and well-maintained. Come see what sets us apart! Go ahead and fill out the form. To get started with your free trial, simply fill out the form and we’ll be in touch with options for your first visit. If you’re new to CrossFit, we will steer you into a smaller class so we can get to know you better and spend more time with you while you’re learning the basics. Or if you prefer to learn in a more intimate setting, we offer private training packages that can be scheduled at your convenience. Make sure you hydrate (you should be doing that anyway!) and plan to arrive 15-20 minutes early. Wear workout clothes, sneakers and bring a towel and a water bottle. Make sure you’ve filled out your participation agreement. 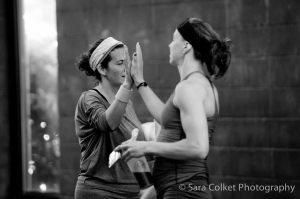 When you arrive, a coach will greet you to discuss your goals and any movement limitations you may have. We’ll then use this information to customize the workout to suit your experience, your needs and your abilities. Don’t worry… we’ll be right there beside you! During your 60 minutes with us, we start class by reviewing that day’s workout. We’ll kick off with a gradual warm up and stretching that get’s the motors primed and muscles warm. We’ll then transition the class into a thorough skill review that covers each of the movements we’ll be using in that day’s workout. We’ll spend some of this time getting to know you and adjusting the movements based on your experience, abilities and goals. 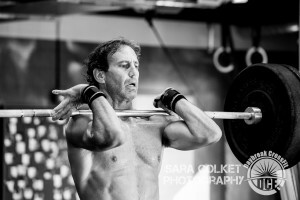 After skill review, we’ll get into the heart of the hour, which is the Workout of the Day, or WOD. Lastly, we’ll cool down, stretch and bask in the glory of completing a kick *ss workout! Continue to drink and replenish those muscle stores! A protein shake or electrolyte (e.g. coconut water) beverage is recommended. You may experience some delayed soreness that night or in the subsequent 24-48 hours. It’s normal! Continue to move, stretch and make sure you get your next visit planned as you ease your way into a sustainable CrossFit routine which balances both workout and rest/recovery days. $149 FOR YOUR FIRST MONTH! If you like what you experienced during your free trial week, you may take advantage of our 1-month intro membership for only $149! This gives you 30 days of unlimited access to Daybreak to experience more classes, more coaches and meet more members! And if you’re new to CrossFit, we will also include a 30-minute private training session (~$60 value) to review the basics and help you integrate more quickly into our class environment.